We were visiting mates at the very larney Eagle Canyon golf Estate North of JHB when we came across Albert, one of the estates security guys in this pimped out Polaris 570 Ranger. We got chatting to the man and found out that the guys from Katay Racing built the Ranger to the golf estates specifications. 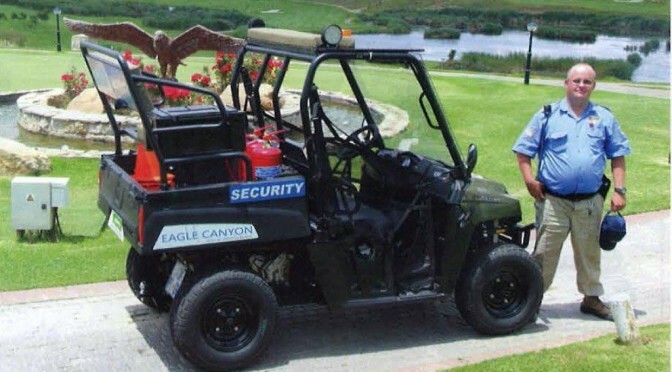 The estate needs a machine that was more economical to run than their bakkies. 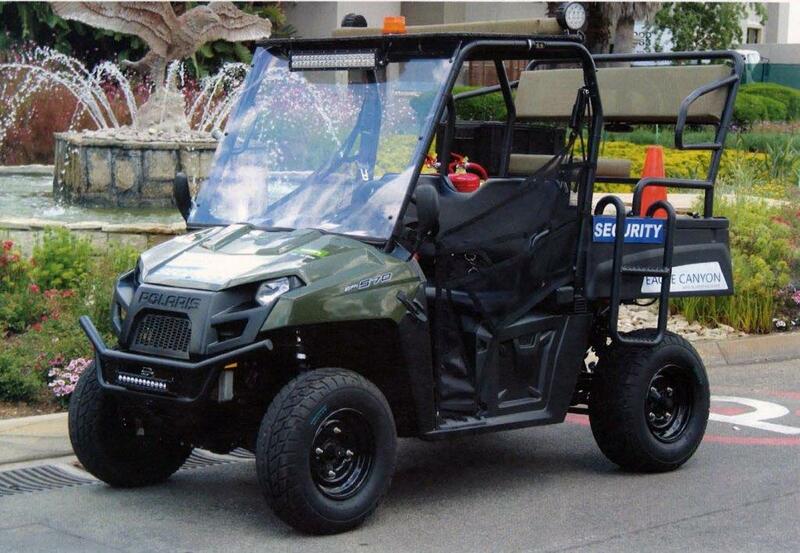 They need a vehicle that has greater range and better performance than a golf cart. They also need a vehicle that is narrow enough to traverse the golf cart lanes and greens, without destroying them. 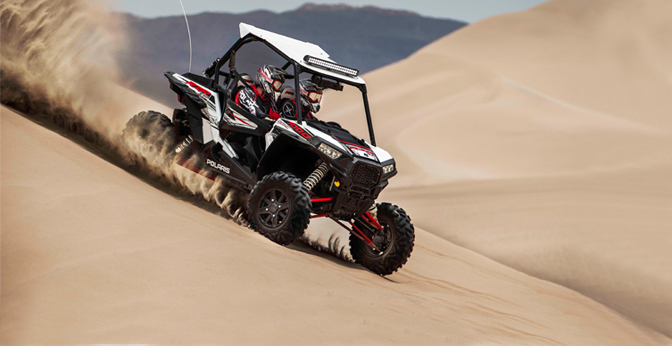 The Polaris fits the bill. 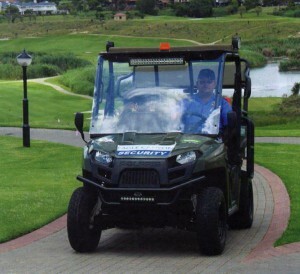 It is a lot smaller and far more economical to run than a bakkie -and it is a bit faster than a golf cart when in pursuit of a crook with a flat screen TV balanced on his head. Add to this that the Polaris incorporates turf mode and 4wd. 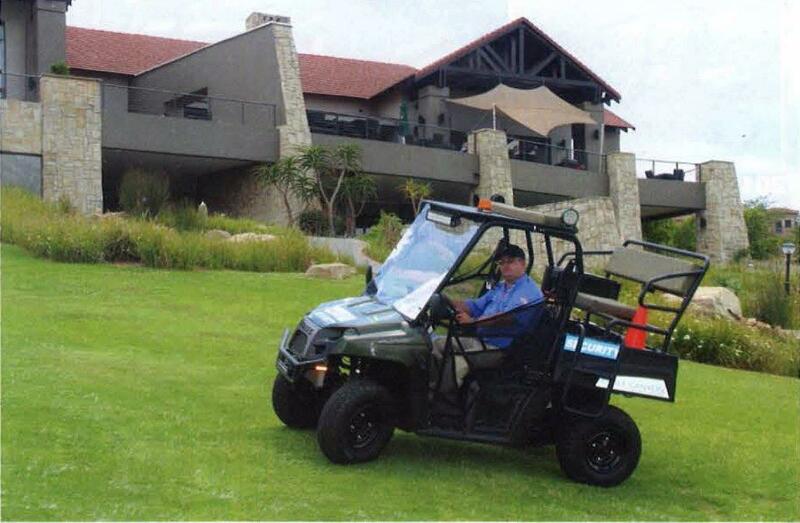 Radial tyres from Batt tyres are fitted, they have a road tread pattern and are not tear up the driveway aggressive, so you have a side by side that will not destroy the greens and will be able to climb the koppies when the aforementioned crook takes refuge behind a rock. 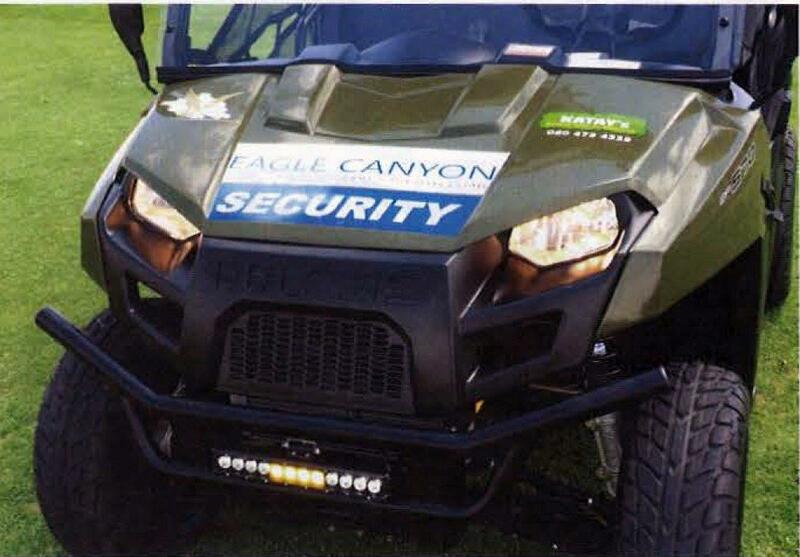 In addition to those specs, Eagle Canyon was looking for a few added extras- lights, in the form of rather bright LED lights and a flasher on top, so that people are aware of the vehicles presence and a first aid box, so that when the crook is eventually run over, they can apply a band aid. They also requested an extra seat out back for an extra passenger and some fire fighting equipment. This was supplied in the form of a single seat complete with a ladder for clambering up and down into the back. 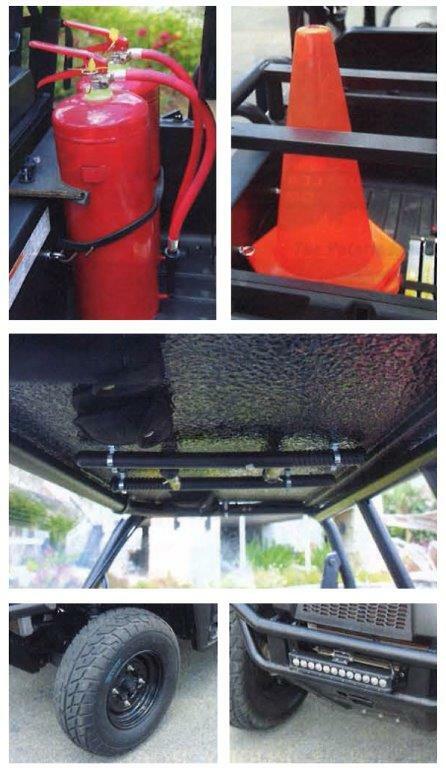 A long fold up ladder is boppa’d under this seat and 2 fire extinguishers, one for bush fires and another for chemical fires are neatly mounted without interfering with the passenger. Inside the cab, Katay Racing has incorporated clips into the ceiling. These hold truncheons, pepper spray and handcuffs – all for assisting the crook with his visit to the local hospital. A high powered hand help spotlight is packed into the cubby hole. One last thing. As you might know, golfers are an excitable bunch, so Eagle Canyon did not want a machine that roars around the place causing their clients to shout ”FORE!” To this end, although the stock pipe is pretty quiet, Katay Racing is developing a super quiet exhaust that won’t adversely affect the performance of the Ranger. Article was featured in Dirt and Trail – 5 Feb 2015. 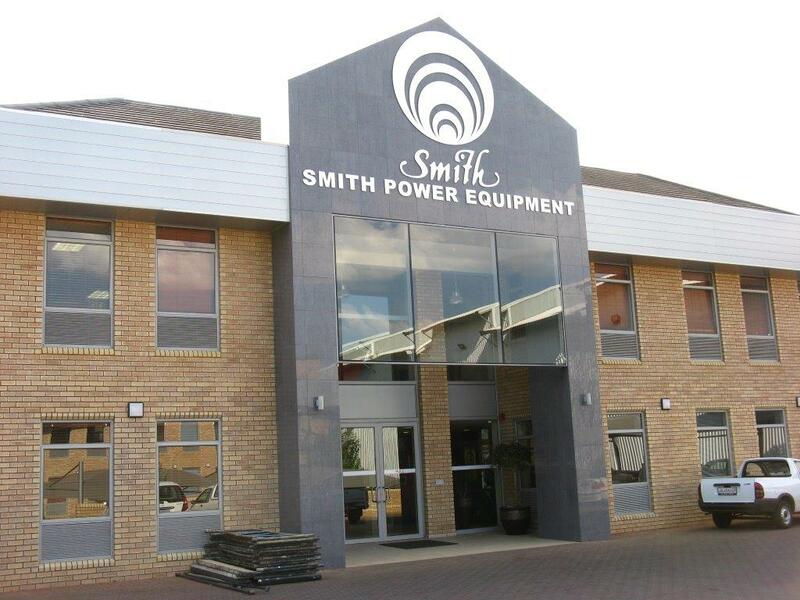 Polaris is distributed in South Africa by Smith Power Equipment.